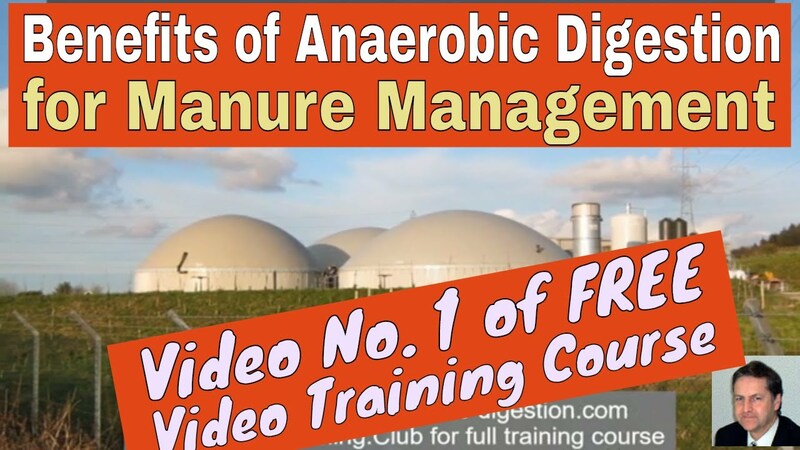 Watch this blog for Anaerobic Digestion News and information. This blog is unique. It is independent and carries News from all AD sources. We are not allied to any particular manufacturer or product, so you will see all the Anaerobic Digestion News here first. Biogas analysis and maximizing the efficiency of anaerobic digestion plants is gaining more attention, as the anaerobic digestion industry matures. The highest prices are only available for top quality biogas with a consistently high calorific value after upgrading (purification). To do that operators need to pay close attention to the quality of the digester off-gas. 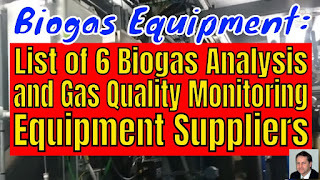 Thankfully, robust and low cost biogas analysis sensors are available from a number of manufacturers, for controlling the various biogas quality upgrading processes. 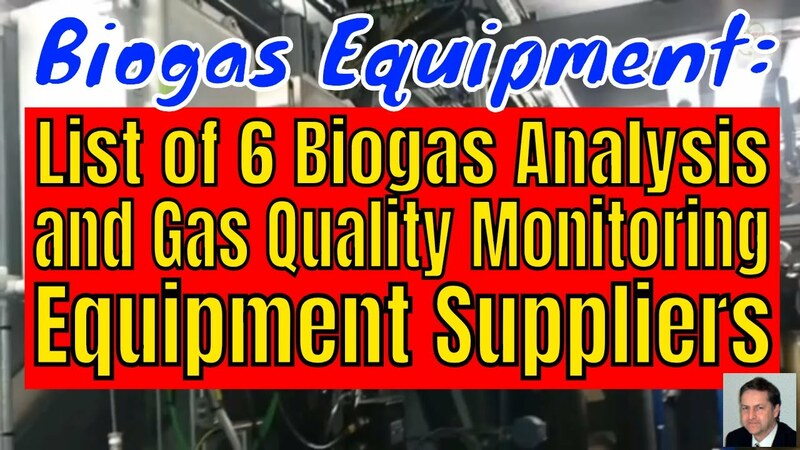 Many devices combine the functions of biogas flow measurement with quality monitoring systems for a wide variety of needs. 1. GEOTECH Gas Analysers for Landfills and the Biogas Sector. 2. Cameron Instruments – Multitec Biocontrol. 3. Union Instruments – Inca Biogas Analyzers. 4. Wilexa Energy – CSM Continuous Siloxane Monitors for Landfill Biogas. 5. Progeco – Biogas Analysis Equipment. 6. Avensys Solutions – Awiflex Biogas Analyzer. The need to continuously measure methane (CH4) and carbon dioxide (CO2). can be joined with a need for analysis of the much lower low percentages of CO, H2S, N2, O2, which can also be found in the biogas composition. Thankfully, monitoring equipment has been developed to do what is needed. For the full article go to:. The most obvious sanitary benefit of installing an anaerobic digester system is the improvements to toilet facilities in the households. Throughout China and other developing countries, where no sewer system is in place, toilet facilities are in simple shacks. The toilet is generally a slot in the floor with either a pit underneath or alternatively a trough running to a storage pit behind the building. In the case of a pit toilet, the slurry in the pit is often literally moving with insect larvae, and in all cases the toilets are smelly and fly infested. For these reasons, toilets are generally located as far away from the other household buildings as practical. Life cycle assessment (LCA) is a tool that can be used to compare the environmental impacts of different products throughout their entire life cycle (European Commission, 2010). The LCA has been used to compare different biogas production technologies (Rehl and Muller, 2011; Poeschl et al., 2012a). 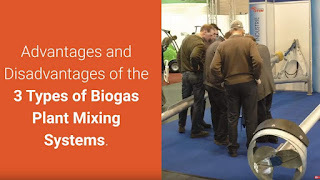 Several studies have also focused on technologies for biogas production from manure and different co-substrates for manure (Hamelin et al., 2011; Rehl and Muller, 2011; De Vries et al., 2012; Poeschl et al., 2012a). However, very few studies have focused on the vast number of small-scale biogas digesters being deployed in developing countries. Only one single study has been identified (Chen et al., 2012) and this study largely ignores the issues of CH4 leakage and release and nutrient recycling. With the current UK calculating being done on the LCA impact of biogas production, it will soon become be easier to make comparisons with other fuels. SimGas biogas systems are fully integrated farm solutions designed to reach millions of rural households in developing countries. Our systems enable rural households with livestock to use the manure from their livestock to generate clean fuel for cooking and organic fertiliser. Digesters are arguably even better, though, when they're in poor or developing countries. According to the Center for Climate and Energy Solutions, small-scale anaerobic digesters like the one Porter and Mazur want to build on Everest are commonly used in rural communities to meet heating and cooking needs. China, for example, has an estimated 8 million anaerobic digesters. Nepal - where the one in question would be built - already has 50,000. The most obvious sanitary benefit of installing an anaerobic digester system is the improvements to toilet facilities in the households. Throughout China and other developing countries, where no sewer system is in place, toilet facilities are in simple shacks. The toilet is generally a slot in the floor with either a pit underneath or alternatively a trough running to a storage pit behind the building. In the case of a pit toilet, the slurry in the pit is often literally moving with insect larvae, and in all cases the toilets are smelly and fly infested. For these reasons, toilets are generally located as far away from the other household buildings as practical. The world today uses epic amounts of non-renewable resources. as we grow old, our backs tend to give senior citizens trouble. Gardening is hard on the back. Aquaponic systems can be designed to ensure you never have to bend over to plant or harvest. lower cholesterol. Many organizations and countries around the world are seeking to find new sustainable ways to produce food due to the world food crisis. Hydroponic and aquaponic systems have plenty of benefits for developing countries and make use of he output from digestion, known as digestate. Unfortunately, the digested may still contain some diseases, especially when the digestate has been output after the source has been recognized as including some animal by-products. The control of pests and diseases of plants grown in aquaponic systems is a problem since pesticide use is clearly limited by the high sensitivity of water pollution which may be caused by it. In general, published data indicate that a digestion time of 14 days at 35 C is effective in killing (99.9 per cent die-off rate) the enteric bacterial pathogens and the enteric group of viruses. However, the die-off rate for roundworm (Ascaris lumbricoides) and hookworm (Ancylostoma) is only 90 per cent, which is still high. In this context, biogas production would provide a public health benefit beyond that of any other treatment in managing the rural health environment of developing countries. Energy shortages in developed countries turned out to have an impact on developing countries such as Indonesia (Simamora, 2006). The declining of the reserve natural energy and the increasing of human needs for living force them to always make effort and innovate to solve their problem. Any effort for a renewable substitute for fossil fuel based household energy is by developing biogas that have raw material from cattle manure. The biggest parts of Indonesia are rural area which have source income in form of integrated agriculture product, one of them is cattle, so the developing of Biogas is really potential. So far, Productivity and Socialization of Biogas energy in the countryside have not conferred maximal product outcomes. Many developing countries, such as Colombia, Ethiopia, Tanzania, Vietnam, Cambodia, have promoted the low-cost biodigester technology aiming at reducing the production cost by using local materials and simplifying installation and operation (Botero and Preston 1987; Solarte 1995; Chater 1986; Sarwatt et al 1995; Soeurn 1994; Khan 1996). The model used was a continuous-flow flexible tube biodigester based on the "red mud PVC" (Taiwan) bag design as described by Pound et al (1981) and later simplified by Preston and co-workers first in Ethiopia (Preston unpubl. ), Colombia (Botero and Preston 1987) and later in Vietnam (Bui Xuan An et al 1994). More than 7000 polyethylene biodigesters have been installed in Vietnam, mainly paid for by farmers (Bui Xuan An and Preston 1995). Developing countries have struggled to supply stable forms of energy to many of their inhabitants. According to the World Energy Outlook, approximately 80 percent of people without electricity live in rural areas in Sub-Saharan Africa and developing Asia. With no other alternative for energy, many people already rely on biogas and struggle to efficiently transport and store it. The technology is therefore in a good position to be developed and extended. 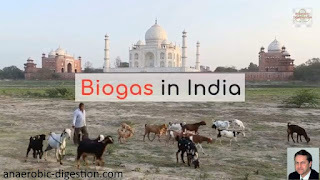 While technically biogas in India can be produced from any kind of natural product, the majority of times, biogas is produced from natural waste. This waste might make up farming and crop waste, human waste and animal waste (cow dung for example). With a calorific worth of about 5000 KCal/ m3, biogas is an exceptional fuel for heating functions along with for producing electrical power. Biogas production has actually been quite dominant in India at home and community levels (especially in rural backwoods) than on big scales. In towns especially, lots of little biogas crops utilize the livestock waste (especially cow dung) and offer biogas utilized for house heating and cooking. It is approximated that over 2 million such biogas plants have actually been put into use, all through India. When organic matters like cow dung, agricultural wastes, human excreta etc. subjected to bacterial decomposition in presence of water in absence of air, a mixture of CH4, C02, H2, H2S etc. is produced. These gases together is known as biogas. The residue left after the removal of biogas is a good source of manure and biogas is used as a good source of non-polluting fuel. A one-cubic-meter digester, primed with cow dung to provide bacteria, can convert the waste generated by a four-person family into enough gas to cook all its meals and provide sludge for fertilizer. A model this size costs about $425 but will pay for itself in energy savings in less than two years. That's still a high price for most Indians, even though the government recently agreed to subsidize about a third of the cost for these family-sized units. If a biogas plant is taken care off well, it can be used for up to 25 years.
" Dr Aggarwal set up the plant at his home 4-5 years back. Describing how it functions, he shares, "Everyday, 10 kg cow dung, along with 15 litres of water, is put in the mixing tank. "The cow dung is brought from the cowsheds from nearby areas, where the owners want to dispose it anyway. This mixture is fermented inside the fermentation tank by the anaerobic bacteria. The mixture is then converted into slurry through which methane gas and carbon dioxide gas are released,"
The bio-gas is obtained from plant, animal and human waste, is also called as gobar gas in India. The main source of biogas is wet cow dung. The other sources of biogas are: sewage, crop residue, vegetable wastes, waste wood, dry leaves of the plants, broken branches of trees, garbage, waste paper, poultry droppings, pig manures, algae, ocean kelp etc. These plants are commonly known as Gobar gas plants because the usual raw material is cow dung (Gobar). The methodology involves in the process is to prepare a slurry of cow dung with water. Water is also be added to the slurry. Home biogas plants produce biogas from cow dung and certain organic household waste. This allows families to cook without any worries. There is no smoke any more, and the tedious chore of collecting wood is also dispensed with. Many women and children were busy collecting firewood one day a week; now they have more time to work and play. The systems used in the production of biogas today are not efficient. There are no new technologies yet to simplify the process and make it abundant and low cost. This means large scale production to satisfy a large population is still not possible. Although the biogas plants available today are able to meet some energy needs, most individuals and governments are not willing to heavily invest in the sector. This aspect has led many people to put up biomass systems in their homes, which are short on capacity. With the Feed-In Tariff (FIT) confirmed to close in just nine months’ time, this was an opportunity for the government to prove that it is committed to providing the investment that is absolutely critical to supporting small-scale renewables, which make a vital contribution to decarbonising and meeting increased demand for electricity in the UK. Unfortunately, this is an opportunity that has been well and truly missed. As well as providing renewable baseload power, anaerobic digestion (AD) combined heat and power (CHP) under the FIT has been vital in helping to decarbonise the farming sector. With the government no longer providing direct for support for the generation of renewable electricity, on-farm AD will struggle to deliver its numerous non-energy benefits, which include reducing emissions from wastes, improving air quality and resource management, and restoring soils through the production of nutrient-rich biofertiliser. This also puts at severe risk the more than 300 AD CHP plants currently in the planning pipeline. It’s therefore vital that the government rethinks its baffling decision to have no new low-carbon electricity levies until 2025, which risks creating a valley of death that small-scale technologies such as AD could easily fall into. So, how did we arrive at this point? The story so far on the UK government closure of the Feed-in-Tariff (FiT) which was introduced in the 2000s to encourage the adoption of renewable energy technology in the UK. 31 March 2019, marks the date after which no more new schemes will be considered for the subsidy. Existing schemes will be honoured. They will still be paid-out-on over the original individual durations of scheme agreements. Nobody would seek to suggest that overall the FiT has not been successful, given that the UK is currently not only complying with its targets for renewable energy, but exceeding them. However, many in the UK biogas industry would argue that the FiT or a replacement scheme for biogas, should have been introduced. This is given the youthfulness of the technology (younger in development than wind and solar technologies), and the additional benefits of anaerobic digestion, which are unique. These are benefits which will assist the government to comply with targets for climate change abatement, air quality, and agricultural emissions for example. In the following excerpts we have endeavored to tell the story of the FiT wind-down which was started by the UK government started in the summer of 2018. July 24, 2018: The UK’s Department for Business, Energy & Industrial Strategy has set out a proposal to close the country’s Feed-In-Tariffs (FITs) scheme. In the proposal, the scheme would be closed to new applications after 31 March 2019. Feed-In-Tariffs are the UK government’s subsidy scheme for generation of renewable electricity from small-scale low-carbon installations. Both anaerobic digestion and combined heat and power (CHP) agricultural installations have been greatly supported by the Scheme. The government is hosting a consultation until 13 September 2019 on the proposed changes. An impact assessment has been released to accompany the consultation. According to the consultation, the FIT scheme was introduced to support the widespread adoption of small scale (up to 5MW) low-carbon electricity generating technologies, intending to give the wider public a stake in the transition to a low-carbon economy. In the course of 2017, Ireland intends to initiate the energy reform with a new feed-in tariff for renewable energies. The government plans to increase the amount of green electricity from the current figure of about 23 percent to 40 percent by 2020. The tariff system is to establish a favourable environment for biogas plant operation. In view of the extensive agricultural and waste resource potential available in Ireland, WELTEC BIOPOWER UK will showcase its AD plant technologies at the Energy Now Expo Ireland, which will be held in the end of October in The Hub in Kilkenny. In early September, the Irish Department of Communications, Climate Action & Environment (DCCAE) announced the adoption of a new subsidy regime to promote renewable energies, to be known as the Renewable Energy Support Scheme (RESS). So far, Ireland has been the only European country without an incentive scheme for heat from renewable sources. July 31, 2015: France is set to increase its feed-in tariffs for biogas installations and small photovoltaic (PV) systems, says the Ministry of Ecology, Sustainable Development and Energy. The feed-in tariff for electricity produced by cogeneration installations running on biogas will be raised for both new and existing installations. On a project basis, depending on individual size and feedstock used, the increase will be between 10 and 20%. A 300 kW anaerobic digestion unit that uses cow manure from approximately 200 cows, for example, will increase its annual income by between €40,000 and €50,000. Feed-in tariffs in Australia are the feed-in tariffs (FITs) paid under various State schemes to non-commercial producers of electricity generated by solar photovoltaic (PV) systems using solar panels. They are a way of subsidising and encouraging uptake of renewable energy and in Australia have been enacted at the State level, in conjunction with a federal mandatory renewable energy target. Since its enforcement in 2012, purchase prices of FiT have been re-examined every year. As a result, that for solar PV has been lowered and some new categories have been created for wind, hydro and biomass. A state renewable portfolio standard (RPS) encourages or requires utilities to use or buy renewable energy or renewable energy certificates (RECs) to account for a certain portion of their retail electricity sales by a certain date. A REC is a tradable certificate documenting that 1 megawatt-hour of renewable electricity was generated at a specific facility. The goal of an RPS is to stimulate market and technology development so that renewable energy can become more competitive with conventional forms of electric power. A state RPS helps create market demand for renewable energy. Owning a renewable energy facility and its output generation. Purchasing electricity from a renewable facility. Read our 5 Anaerobic Digestion Advantages article here. View the above video on YouTube here. This video presentation (top of page) contains images that were used under a Creative Commons License. Click here to see the full list of images and attributions. 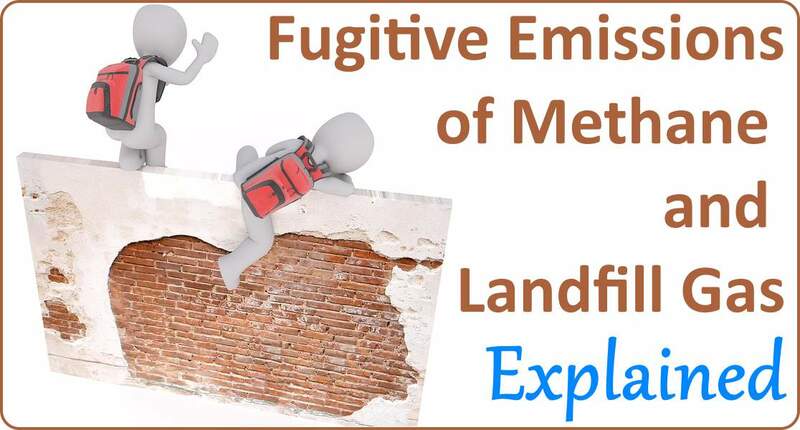 It is well known that unintentional escapes of methane and landfill gas (fugitive emissions) occur when methane escapes from a myriad of tiny leaks from production facilities, wells, pipes, compressors and other equipment. Methane continually escapes through tiny leaks from the equipment associated with coal mining or natural gas extraction, landfills, landfill gas utilization plants, and biogas plants. It is obviously very important to reduce all these fugitive methane emissions to an absolute minimum. Methane is more than 80 times more damaging to the atmosphere and more powerful than carbon dioxide over a 20-year time frame. It's the second leading contributor to climate change, after carbon dioxide. Methane accounts for approximately 25 % of the world’s climate warming. Accidentally released methane emissions are the inevitable byproduct of the oil and gas industry and agriculture, and occur from all methane equipment. But, not only from equipment it also gets released when cattle blow-off! Vegans are right when they say reducing demand for dairy and meat will help the environment. 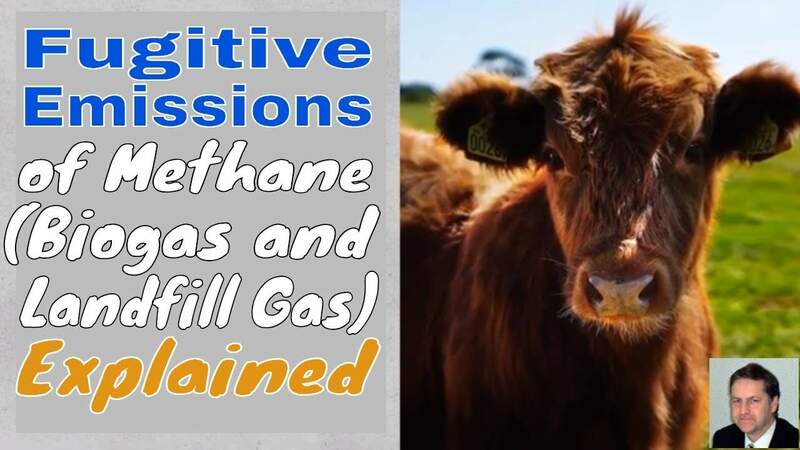 80 % of the Geenhouse Gas (GHG) emissions due to enteric fermentation (digestion in stomachs) are from the digestive systems of cattle. 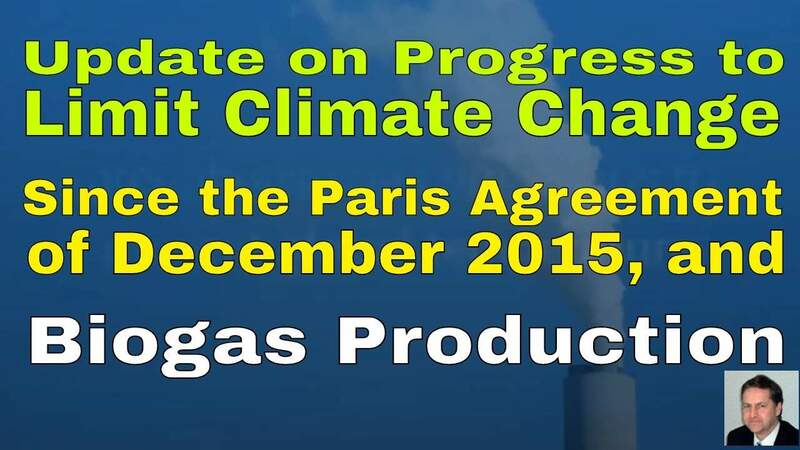 But, that's enough about cattle emissions, what about biogas plants which imitate cattle to make methane. Unintentional emissions will be occurring from all biogas plants. Storage tanks inevitably leak a small amount, as do pipe joints, valves and other equipment. Other fugitive emissions will occur when digesters are opened-up for maintenance, and during commissioning. However, biogas plant and landfill gas utilization plants would be expected to be similar to those for the natural gas supply industry. Fugitive emission research conducted within the natural gas industry estimates the US national methane fugitive emissions rate for natural gas at about 0.42%. A not insignificant amount overall, and it needs to be reduced. However, the amounts are tiny when compared with the fugitive emission of methane from cattle, and landfills. Municipal solid waste landfills are the third-largest source of human-related methane emissions in the United States, accounting for approximately 15% of these emissions in 2016. Similar figures apply to all developed nations. But, as Vegans can point out. This is well below the 26% emitted from cattle through enteric fermentaton. Thanks for watching right through! 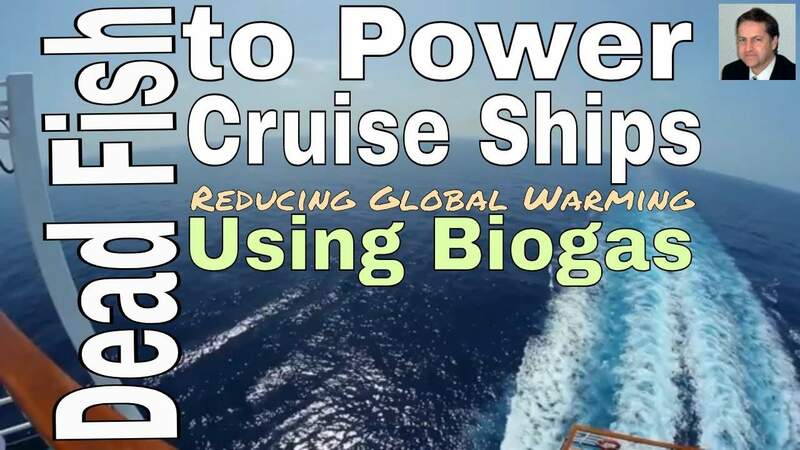 Waste fish parts will be used to power ships in a new initiative to use green energy for polluting cruise liners. The leftovers of fish processed for food and mixed with other organic waste will be used to generate biogas, which will then be liquefied and used in place of fossil fuels by the expedition cruise line Hurtigruten. Heavy fossil fuels used by ocean-going transport are an increasing problem as they are even more polluting than fuels for land-based vehicles, emitting sulphur and other contaminants. The fuels contribute to air pollution as well as to climate change. 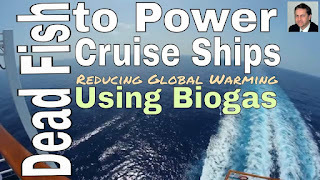 Converting vessels to use biogas will cut down on pollutants and reduce greenhouse gas emissions. Hurtigruten operates a fleet of 17 ships and by 2021 aims to have converted at least six of its vessels to use compressed biogas, which is a renewable form of liquefied natural gas (LNG). 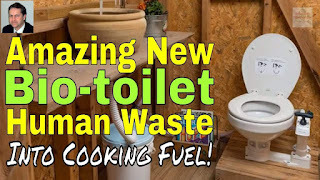 Biogas can be generated from most forms of organic waste by speeding up and harnessing the natural decomposition process to capture the methane produced. Read the full article in the Guardian online. The shipping industry is being forced to convert to cleaner burning fuels, however, or install scrubbers. The European Union and China already have regulations in place that place caps on sulphur emissions for ships making port calls in Europe and China. And starting in 2020, the International Maritime (IMO) will require all vessels operating in international waters to meet new emissions caps, which will mean they will either need to switch to lower burning fuels, like methanol, LNG or diesel, or install scrubbers. Many are opting to install scrubbers and continue using bunker fuels, simply because bunker fuel is widely available at ports around the world. Other fuel sources, like LNG, aren't. Passengers on a cruise ship could be inhaling "60 times higher concentrations of harmful air pollutants " than they would in natural air settings, Naturschutzbund Deutschland (NABU), a German environmental association, has warned. Measurements were taken at various spots on the ship and for this particular sample, the sun deck and jogging lane on the top deck were found to be most affected by pollution. "But of course this can vary along with the wind and weather conditions. So potentially every part of the ship can be affected significantly," Mr Rieger said. When the gargantuan Harmony of the Seas slips out of Southampton docks commercial voyages, the 16-deck-high floating city will switch off its auxiliary engines, fire up its three giant diesels and head to the open sea. Biogas power will generate Green Electricity for a Norfolk Military Base, it has been announced. An Anaerobic Digestion Plant RAF joint venture, will result in almost all of the Norfolk base's electricity requirement. It will from now on be supplied from a new on-farm green renewable energy resource NOW operating. The RAF Marham military base will be supplied from the Biogas Plant Shown here. 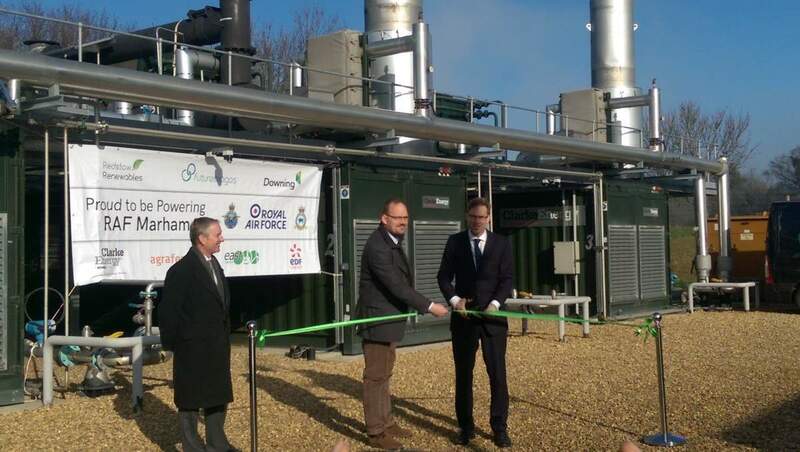 Minister for Defence People & Veterans Tobias Ellwood MP has described anaerobic digestion (AD) as “a truly green and sustainable solution” as he launched a new deal that will see a Norfolk military base receive almost all its power from a nearby AD plant. Future Biogas’s Redstow Renewables AD plant, which converts locally harvested crops such as maize, sugar beet, rye, and potatoes into renewable electricity (in the form of biogas made from the whole crop including the leaves and the stalks), and natural fertilizer. This will meet over 95% of the power needs of the nearby RAF military base. The base will be the first in the UK to run almost entirely on green electricity. The AD plant will generate 4.5 megavolt amperes of electricity every day, enough to power 350,000 LED bulbs. The deal will save the Ministry of Defence nearly £300,000 every year and reduce its carbon emissions by 14,000 tonnes of CO2 annually. The waste residue from the AD process, will also be dried and used as fertilizer to help grow local crops. RAF Marham is leading the way as Britain’s first green military airbase. The biogas fuel is a truly green and sustainable solution, helping us tackle climate change, support the local economy and save taxpayer money. "I hope that this plant can act as a model and we can see more sustainable energy schemes rolled out across other military bases." If watching this on YouTube, click on the links in the description below. 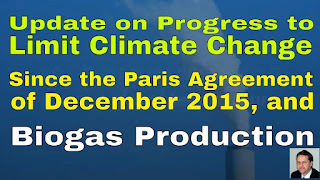 Help promote biogas production! Share this video! News of Biogas Power which is providing Green Electricity to a Norfolk Military Base, and high praise for the green credentials of biogas production. Why then is the same government ending the Feed-in-Tariff subsidy at the end of next month (March 2019)? The 197 signatories of the Paris Agreement committed to curb greenhouse gas emissions to prevent global temperature exceeding the pre-industrial average by more than 2°C. Since the agreement was signed in December 2015, every signatory has ratified it into law and some 1,500 pieces of legislation have been enacted to drive compliance. Three years ago, climate science indicated that beyond 2°C there was increasing risk of passing a "tipping point"', where feedback loops within the climate system will propel runaway change. But in October 2018 the Intergovernmental Panel on Climate Change (IPCC) reported its findings from a three-year study comparing the impacts of climate change if limited to 1.5°C, compared to 2°C. It drew on 6,000 scientific contributions and 42,000 expert and government opinions. Halting global temperature rise at 1.5°C above pre-industrial levels would bring major benefits for the environment, society and economy, the report says. It warns that the global impacts of climate change will be much more severe under a 2°C scenario than previously estimated. The report highlights the need to adopt the 1.5°C threshold to prevent "dangerous climate change". The IPCC emphasizes that the global temperature is already 1°C above the pre-industrial average. That's the end of our progress update, since the Paris Agreement of December 2015. So what can be done now, without waiting for new technologies, and also make a difference by helping all governments to comply? The answer is to introduce ambitious targets to accelerate the installation of on-farm biogas plants. That's because: Worldwide GHG emissions from livestock supply chains are estimated to produce 7.1 gigatonnes of carbon dioxide CO2 equivalent (CO2e) per annum. This represents 14.5% of all human-induced emissions. Of the total, storage and handling of manure represents 10 per cent. 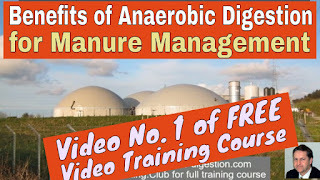 Therefore, On-farm anaerobic digestion (AD) of manures has significant potential to capture methane as a renewable energy source and, as a consequence, to reduce net global GHG emissions. UK biogas production in 2018 already created enough power to replace one major UK power station of which there are about 1 dozen in operation. That's easily enough, to "make a difference"! 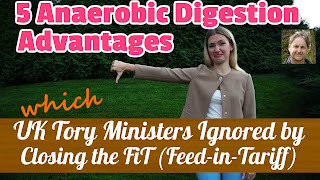 So, we encourage you to promote anaerobic digestion and biogas to your politicians, and return here to comment, and tell us about the replies you get. and 2. the IEA Bioenergy report, " Exploring the viability of small scale anaerobic digesters in livestock farming", by Clare Lukehurst and Angela Bywater (2015). 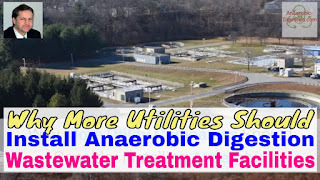 Video by: www.anaerobic-digestion.com . Biogas plant designers will tell you that the main factors that influence the rates (and, therefore, the success) of these biological transformations in the AD reactor are hydraulic and solids residence time (HRT/SRT), temperature, pH and the presence of toxic materials. But, that omits one other essential requirement which can be left to chance on some occasions, and that is getting the tank agitation, or more commonly called 'mixing". right. Unmixed, low rate AD reactors will stratify into four zones (layers): Floating scum; liquid supernatant; actively digesting solids; and digested and inert solids. Mixing systems for high rate AD reactors are typically designed to achieve a specified percentage of active working volume, typically defined as the total volume of the reactor minus an allowance (usually 10%) for the floating scum layer, and the inerts layer at the bottom. Mixing systems try to minimize the sizes of these two capacity-stealing layers. Working volumes less than 85 percent are inefficient digester reactors. Exhibition attendees looking at an in-tank propeller type biogas mixing system. Mixing the digester requires a significant amount of energy, which becomes a parasitic load on the output of energy which can be used on-farm or sold. One possibility to operate biogas plants more efficiently is to reduce the energy consumption by avoiding constant stirring. AD Operators and water companies can reduce the energy usage of their digester pumps and mixers by up to 50%, according to leading manufacturer, Landia. While most operators find this to be the answer to high energy use during mixing, some say they can experience more foaming during intermittent mixing. An advantage of gas mixing can be that the high velocity gas-liquid jet causes mixing of the tank at a higher level than the hydraulic mixing. The gas bubbles reduce the density of the liquor in the digester. The result of this is that, low-density materials, such as plant fibers that often float to the surface, will be forced to sink into the tank. This can reduce the floating scum on the surface, and be a very welcome result. Operating an AD plant with lowest possible electricity consumption and minimized OPEX is a key factor in optimizing the total cost over the lifetime of the biogas plant, so the subject of anaerobic digestion reactor mixing is an important one. Existing Infrastructure – Many wastewater treatment facilities in the Pacific Southwest (US Region 9) and across the country, use anaerobic digesters to reduce the volume of the biosolids (sewage sludge) before they are taken off site. The anaerobic digesters produce biogas which is either flared or used onsite as an energy source. Therefore, the energy capturing infrastructure is already in place at many facilities. Existing Expertise – Wastewater treatment facilities already have the on-site expertise and years of experience dealing with anaerobic digesters; vessels that are difficult to operate without thorough knowledge. Located in Urban Areas – Wastewater treatment facilities are often located in dense, urban areas, where compost facilities are not. It makes logical sense for a highly populated area to ship organic waste to a nearby anaerobic digester where the energy content is recovered and the volume reduced. The residual can then be trucked to compost facilities, which are typically located farther from urban areas. via USEPA. 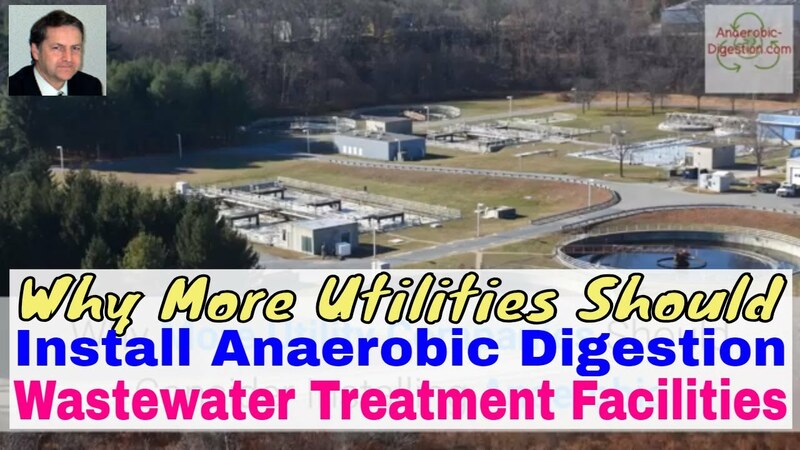 While many local governments and municipalities may be interested in processing food waste in anaerobic digesters at treatment facilities, they may feel that the cost is a limiting factor. However, there are many things to remember before immediately discounting this technology based on cost. infrastructure at the wastewater plant. When a facility accepts food waste at a plant, they can charge the waste hauler a tipping fee for accepting the material. In addition, there is a significant amount of money that will be saved in energy avoidance due to methane production. The excess energy can be sold back to the grid for profit. This article is provided via USEPA. Methanogenesis or biomethanation in a biogas plant is an important process resulting in the formation of methane. The methane can be collected and used as biogas, a renewable fuel. Most of this biogas is produced from biomass on farms, but biogas can also be produced during anaerobic wastewater treatment. Wastewater treatment methods include methanogenic anaerobic digestion, and when used this technology results in the production of biogas and clarified effluent. 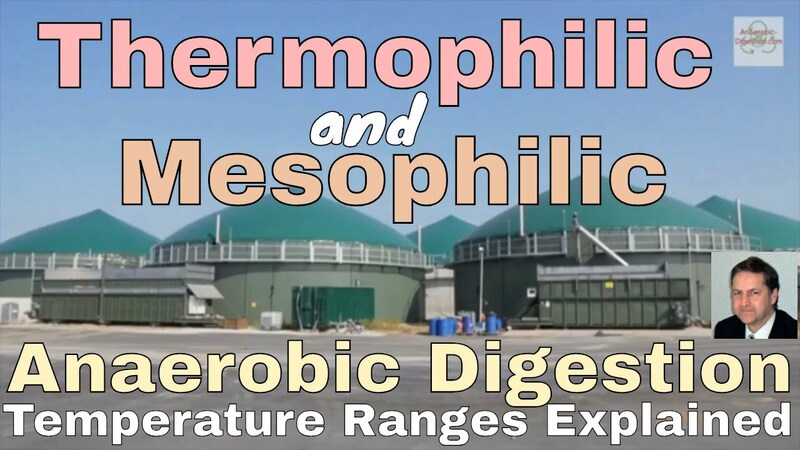 But, to be effective in producing biogas in quantity, anaerobic digestion needs to be conducted within the ranges which existed for millennia in nature, and these are called the mesophilic and thermophilic temperature ranges. The AD Training Club is here. Methanogenic compositions in biogas reactors and methanogenic communities in reactors are only established in fully anaerobic conditions, and currently only when operated at those optimum temperatures. But, does it always have to be like this? Could we alter when biogas is made, including make biogas efficiently a low temperatures. There would be massive benefits from this, especially for cold climate regions. Methanogens are microorganisms that produce methane as a metabolic byproduct in hypoxic conditions. They are prokaryotic and belong to the domain of archaea. They are common in wetlands, where they are responsible for marsh gas, and in the digestive tracts of animals such as ruminants and humans, where they are responsible for the methane content of belching in ruminants and flatulence in humans. To create genetically engineered existing DNA sequences, through synthetic biology would allow scientists to build entirely new sequences of DNA and put them to work in cells. This would allow the building of novel biological devices that would never exist in nature. This is known as synthetic biology. Essentially a process operating by living organisms, the biogas industry is a natural target for synthetic biology. In terms of their genetic content, organisms are classified into three natural groups, Archaea, Bacteria and Eukarya. Most microbes are Archaea and Bacteria, while humans are Eukarya. 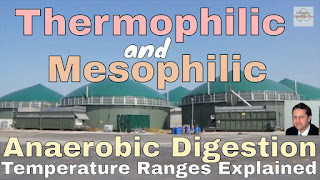 In an anaerobic digester, many different types of Bacteria convert the complex organic matter in waste or biomass to hydrogen gas, carbon dioxide, formate and acetate. A unique group of methanogenic Archaea then produce the invaluable part of biogas, methane, by eating hydrogen and carbon dioxide, formate or acetate. One can imagine creating a super microbe to convert the complex organic matter directly into biogas, thus making anaerobic digestion faster, more efficient and easier-to-manipulate. Making a synthetic microbial community by reprogramming key microbes may also help them work together when a tough job (i.e., eating extremely complex waste) needs to be done. Among numerous microbes in anaerobic digester, methanogenic Archaea are one of a few microbial groups that have been extensively studied, and a number of genetic tools are available for engineering via synthetic biology. Therefore, scientists have begun to reprogram methanogenic archaea, allowing them to eat organic matter such as sugars and directly produce methane. If they succeed, they may engineer a super microbe that never existed in nature and revolutionize the biogas industry by making anaerobic digestion much simpler and more efficient. Synthetic biology, applied to methanogenesis, holds great potentials to revolutionize the biogas industry. To achieve this goal, joint efforts between the biogas industry and academia must be made. There is significant potential for the anaerobic digestion industry to grow, assuming that the benefits of anaerobic digestion and the biogas it produces are fully appreciated. The anaerobic digestion of manure on livestock farms for manure management is a large possible growth area. If it meets its full potential, the UK AD industry could meet 30% of the UK's household gas or electricity demand and create around 35,000 jobs, mainly in rural areas where AD plants tend to be located. AD also improves energy security and soil quality, both major government policy objectives, through producing home-grown renewable energy and a nutrient-rich natural fertilizer respectively. "The UK AD industry has grown by more than 350% over the last ten years and the UK has established itself as a world leader in biogas, with UK companies already exporting biogas-related expertise and equipment. The UK has a real opportunity to be at the heart of the growing global biogas industry, which has the potential to be worth £1 trillion." said Charlotte Morton of the AD industry associations ADBA organisation. Energy produced from anaerobic digestion will come to play a greater role in the global energy mix as countries look to reduce GHG emissions and generate clean energy. The use of anaerobic digestion as a means to utilize organic waste means that it is being incorporated into waste management programmes, to reduce the amount of waste that we either send to landfill or to be incinerated. Through the process of anaerobic digestion, operators can produce a bio-fertilizer, proven to be a cost-effective and environmentally sensitive solution to increase crop yields. The main factors that dictate the potential for an anaerobic digestion market in countries across the world are linked to the availability of feedstock and the state of the regulatory environment. The numerous benefits of anaerobic digestion to generate clean, baseload energy, improve waste management and produce a bio-fertilize to improve agricultural yields will result in a large-scale adoption of the technology, as was seen in parts of Europe in the early part of the 21st Century. Anaerobic digestion facilities continue to receive high levels of investment, proving to be a cost-effective way to utilizing biological waste/organic material to generate energy, as well as achieving significant reductions in greenhouse gas (GHG) emissions. Digestate can be used as fertilizer and soil conditioner as it contains nitrogen and potassium, both being plant nutrients that can significantly improve growth. It is made from dead micro-organisms and remaining indigestible material during the anaerobic digestion process. 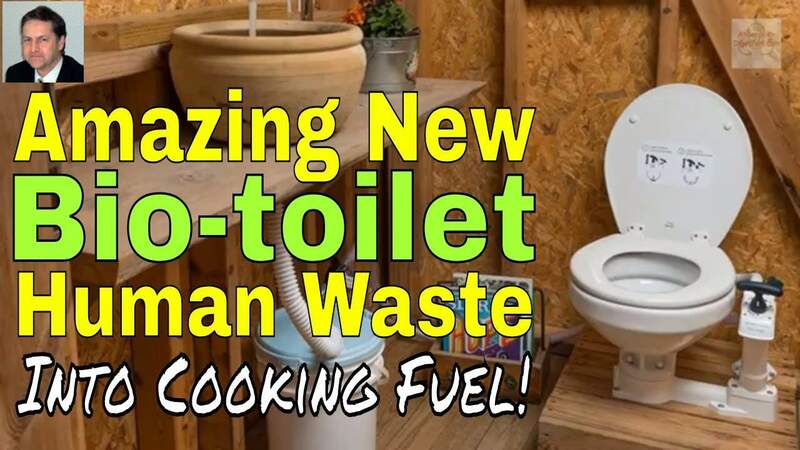 It can be used straight from the digester or separated into liquor and fiber. By using digestate instead of synthetic fertilizers, you can save energy, reduce your carbon footprint as well as decreasing fossil fuel consumption. 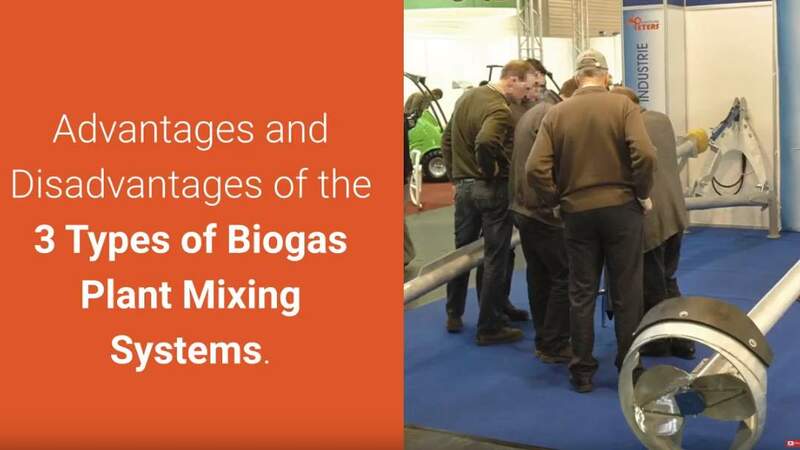 As none of the potassium, phosphorous or nitrogen is present in the biogas after anaerobic digestion, all of these nutrients are present in the digestate. Biogas can either be combusted to make heat and electricity, or as mentioned earlier, can be purified and pumped into the mains gas grid or used as road fuel. You can find more information on how to use biogas for heat only purposes, electricity only purposes or to create combined energy. Consumer demand for greener, lower-carbon products and services is on the rise. As a farm business, embracing renewable energy has many benefits. Not only are farmers investing in the future of our planet with their anaerobic digestion derived energy choice, but they are also appealing to a modern market that is putting sustainability at the top of its priority list. Tie this in with waste reduction, manure management and other sustainability efforts and you'll have a well-rounded plan for becoming and staying environmentally friendly. Sustainable Food Production A safe, nutritious, and affordable food supply is needed to sustain populations worldwide. Farmers work hard to meet the growing food demand and remain viable in today’s global marketplace. Efficiently using water and nutrients for crop and animal needs can cut costs, reduce environmental impacts, and contribute to a safer, more productive farm. Manure digesters on livestock farms can: Protect animal and human health by reducing pathogens. Convert nutrients in manure into a form that is more accessible for plants to use compared to raw manure. This can increase crop productivity and yield. Recycle nutrients on the farm, creating an economically and environmentally sustainable food production system. Produce heat, electricity, or fuel from biogas which can be used on-farm, lessening the agriculture sector’s dependence on fossil fuel energy. Accept food waste from places like restaurants and grocery stores. This means less food waste is sent to landfills. Food waste has the added benefit of increasing the efficiency of farm digesters. 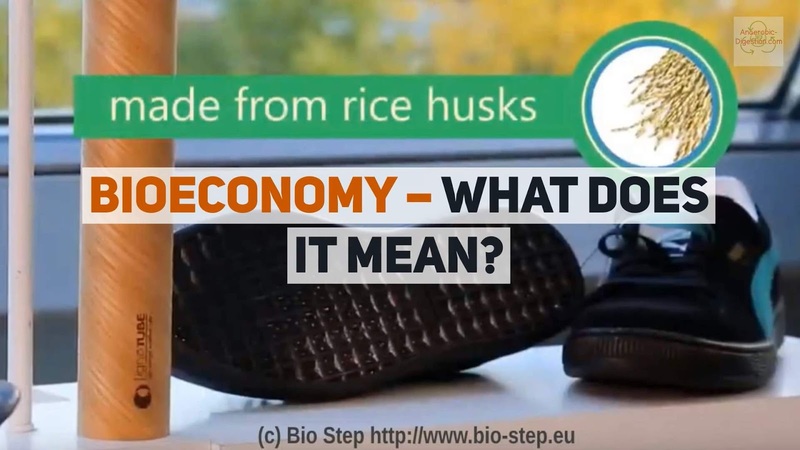 Bioeconomy – What's the Meaning of it? Stay with us a moment and we’ll explain with our definition. Novel new materials made from biology. Plus, we tell you why it’s good for our planet, and can reduce climate change. Our planet is getting more and more crowded. As a result we need to use our resources more sustainably. The bioeconomy is making and selling useful things using renewable materials, which means that these are made from organic, carbon based biological matter, instead of being produced from oil, and are refined in petroleum refineries to make plastics, and synthetic fibers. Most things you buy start out being oil. Even though many people are not aware of it, the bio economy is already part of everyday life. Bioresource technologies are already being used to replace many goods and processes currently based on fossil fuel resources. In some cases bioresource based goods even have novel properties, which can make them superior to the goods we currently depend on. In short, the bioeconomy means using renewable resources for innovative products, instead of the present oil-based economy. Today, we depend on fossil fuels for things like clothing plastics and chemicals. 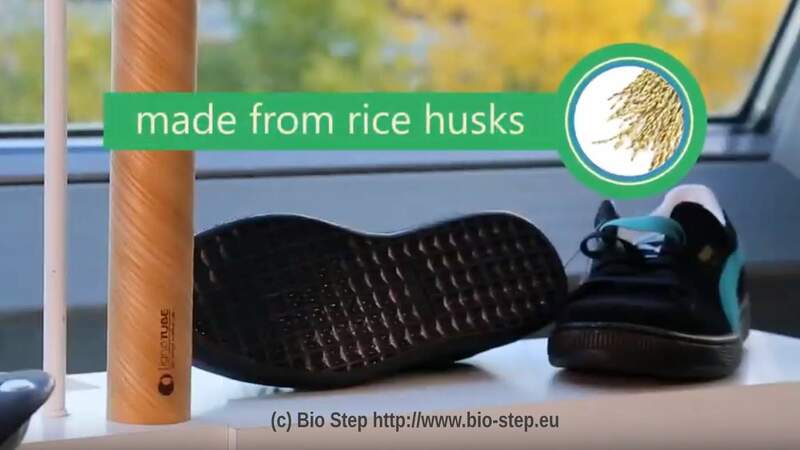 The goal of the bioeconomy is a circular economy producing reusable bio based products. Many nations in Europe are collaborating in EU wide research to become leaders in this growing market. However most people don’t realize that sustainable alternatives already exist, like the shoes you saw at the start. We hope we have helped to raise your awareness of the bioeconomy. The bioeconomy of bio-based development has actually shown up. Market can easily currently create bio-based plastics coming from vegetation oils as opposed to fossil-based resources. Those bio-based plastics could be produced bio-degradable, also in seas, or even they could be produced tough, to substitute glass. Swift are actually the modifications in scientific research and also production, and also therefore extensive are its own ramifications, that some recommend to the brand-new bio-economy, that utilizes bio-based resources for fairly a lot just about anything in our economic climate, as the 4th commercial reformation. The cross-cutting mother nature of the bioeconomy offers an one-of-a-kind possibility. A possibility to adequately take care of linked popular problems like meals safety and security, fossil-resource dependancy, raw material deficiency. it can also bring forward the achievement of environmental improvement, while attaining lasting financial progression. The foresight growth in weather disorders and also boosting deficiency of nonrenewable energy resources need the economic situation to become located ideally on renewable energies. Getting international nourishment additionally requires a rise in performance along with as a result of respect to guarding sources as well as the atmosphere. Innovative natural and also technical expertise as well as techniques for each but maintainable and also demanding development, arrangement and also handling of biomass might cause this modification in the commercial source foundation. As well as bring about lowering the worry on the atmosphere during climate change, as well as to preserving the planet's limited information. Therefore, the bioeconomy supplies a potential chance to integrate financial development along with eco liable activity. To preserve its own competition, Europe is going to need to have to make sure adequate products of basic materials, electricity and also commercial items under ailments of minimizing fossil carbon dioxide sources - oil and also liquefied gasoline manufacturing is actually anticipated to deduct around 60% through 2050. Bio-waste (predicted at around 138 thousand heaps each year in the EU, of which approximately 40 % is actually landfilled) possesses higher possibility incorporated market value as a feedstock for various other effective processes.Biological sources as well as communities might be made use of in a much more lasting, incorporated as well as dependable fashion. Meals refuse works with yet another significant issue. A projected 30 % of all meals made in industrialized nations is actually thrown away. The bioeconomy features major creation, including horticulture, forestation, fisheries and also tank farming, and also sectors making use of and also refining natural sources, including the meals and also pulp and also newspaper markets as well as component of the chemical, biotechnological as well as electricity business. It's free! Just type your email address into the panel below, and you will receive an email each time we post to this blog. Do Anaerobic Digestion Plants Smell?